Tom Ince's future is still in the balance with Palace reportedly failing to agree a deal for him just yet. Stoke can't get another loan so Liverpool are one of the clubs left that are interested. DONE DEAL - Sunderland allow defender Mo Diakite to join Anderson on loan at Fiorentina. As do I bing bong! Mourinho on buying a striker. "Many people don't understand why we don't do [business] but, in the summer, you will understand." Mourinho says no striker deal yet lined up for summer but "we know what we want". DONE DEAL - Everton sign young Czech goalkeeper Jindrich Stanek from Sparta Prague. DONE DEAL - Hibernian seal loan deal for Sunderland midfielder Duncan Watmore. Surely Daniel Levy will try to pull something out the blue? 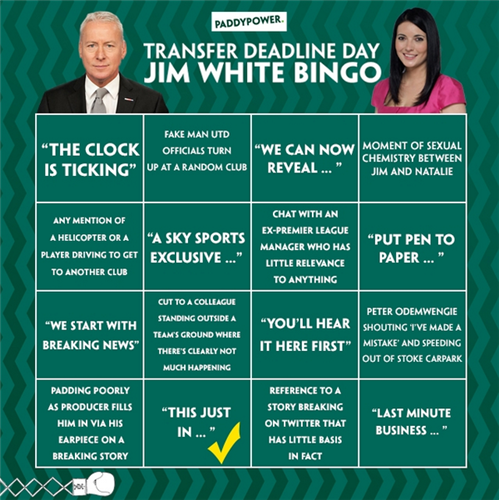 Always does on deadline day! Wondering if Berbatov and Aymen Abdennour medicals taking place simultaneously at Monaco. AA pushing Berba round Louis II in a wheelbarrow? Porto not fussed about letting best players go. Lopez, Alves, Meireles, Falcao, Hulk, Witsel, Rodriguez and Moutinho sold for £182m in 4yrs. Man City News: Sources reporting that Joleon Lescott will be staying at Man City and see out the remainder of his 6 month contract. Good news, Baggies fans. Pepe Mel has confirmed his interest in Espanyol striker Thievy Bifouma. Is there time to get a deal completed? For what its worth, I think Fernando will join today and Mangala in the summer when Lescott leaves on a free. More Thomas Ince news. Now Stoke are interested in a permanent deal for the player. Blackpool want to accept the deal. Ince only wants a loan move. This one is going to continue to run and run. £7 million. That's how much Trabzonspor have bid for this man right here. It's Papiss Cisse in case you have wondered over to a football blog by accident. If so, then please, stick around. 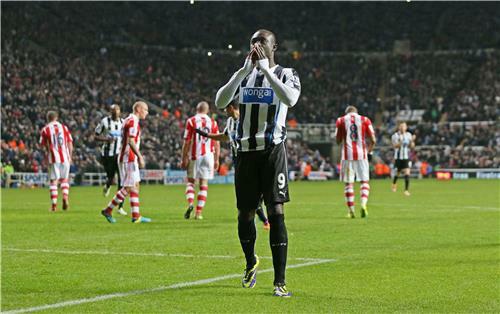 It could be busy eight hours for Newcastle. MailOnline's Neil Ashton reports the club will make another bid for Benfica's Filip Djuricic. Their initial £10m offer was rejected. Boss Alan Pardew believes a deal can struck before 11pm tonight. Today is the final day of the transfer window. Tomorrow the transfer window will not be open because it closes tonight. So just to round-up some of the biggest stories of the day: Chelsea have signed Kurt Zouma, but then said "actually stay where you are in St Etienne until the end of the season." Then Lewis Holtby went on loan to Fulham (BIG MOVE FOR ALL YOU FULHAM...ITES?) And the most relaxed, slick man in football, Dimitar Berbatov has joined Monaco for a career of Poker, Dom Perignon and football (in that order). And of course the BIG ONE. Frimpong to Barnsley. Huge move. 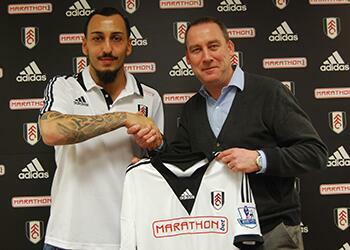 The Kostas Mitroglou tussle is over and Fulham are the victors. Bad news for West Ham. Details of the deal to follow. Mitroglou signs at Craven Cottage for a fee believed to be £12.5m. He has signed a four-and-a-half year deal. 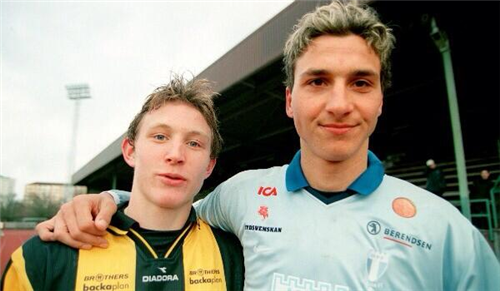 Spartak Moscow have confirmed that Kim Kallstrom will leave to go to #AFC before the window closes. News on Everton? Sky Sports say Johnny Heitinga is at Fulham hoping to finally complete a move away from Goodison Park. Fair play to Fulham. They are making moves in this window. Come end of the season, this day could have proved crucial. Just seen a video of Sam Allardyce poking his head out of a Range Rover window. Does he not know Deadline Day etiquette? Only one man can pull that off. Breaking news from Cardiff. Sky sources say the club have had a £4m bid for Leeds United's Ross McCormack rejected. The striker was also on Sam Allardyce's radar earlier in the window. Stoke's pursuit of Tom Ince is over. The player will now sign on loan at Crystal Palace or remain at Blackpool for the remainder of the season, according to Sky Sports. With six hours remaining, it's time for me to sign off and leave you in the hands of Tom Crocker who'll guide you through to 11pm. Hello again, what have I missed!? So, six hours to go until the transfer window closes. Who will be the standout name of these last few hours? Get involved with the 'comment now' button at the top of this page. Who does your club need to buy? FULHAM MAKE A MOVE, AGAIN: This time it's for Everton's Johnny Heitinga who is close on signing a deal with the London club.